Berets, Baguettes and Bayonets – Three nights in Paris! Still dreaming of Paris? The old Paris, ‘the way we were’ when Parisians were easily recognized through their traditional berets, carrying fresh baguettes and sipping wine at a street café? — Times and sights have changed, and so have we. I am not even sure that our friends would have recognized us, as we were traveling light, only with backpacks and carry ons. Three countries in two weeks: Paris, Bulgaria and Germany. Btw, “Berets” became first fashionable through Napoleon III, when he built the Palais de Biarritz. Many of the laborers wore the useful flat hat for the same reasons the shepherds did. The beret that is so closely knit into the French culture seems to be more of a status symbol today for emigrants and tourists, from all over the world. Currently, Laulhère located in the chic Golden Triangle on the rue du Faubourg Saint-Honoré, a quarter of a mile from the Élysée is the last company in Paris producing these iconic hats and still by hand, since 1840. The Champs-Élysées is 1.2 miles long and connects the Arc de Triomphe with the Place de la Concorde and is considered one of the world’s most famous and beautiful commercial streets! If you visit Paris for the first time, and you are not blessed with an angel, we advise you to hire a guide. 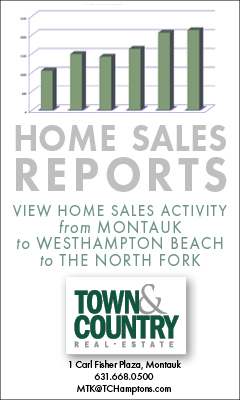 — I am sure that many of our old Montauk friends remember Gurney’s former Chief Engineer, Miro–well his family lives in the outskirts of Paris and Catherine, Miro’s niece, became not only our guide but also invited us to use her cozy one bedroom apartment on the 4th floor of her beautiful apartment complex as well. As the story goes, we had already booked accommodations through AirBnB but Miro insisted that we should cancel the reservation and have his family take care of us. I, Miro and the Monte’s of Gurney’s were close friends for decades and we all to this day take our friendship serious. However, we didn’t expect to find a beautiful home overlooking a charming courtyards, as well as a refrigerator filled with all the specialties one can imagine, including homemade quiche, French cheeses and then some… Catherine or “Kasha” as her family lovingly calls her, even took a day off from work to be our personal tour guide. A short walk from her studio the next morning and we all hopped on a train to Paris. Kasha’s accent, born and bred in Paris, is adorable. 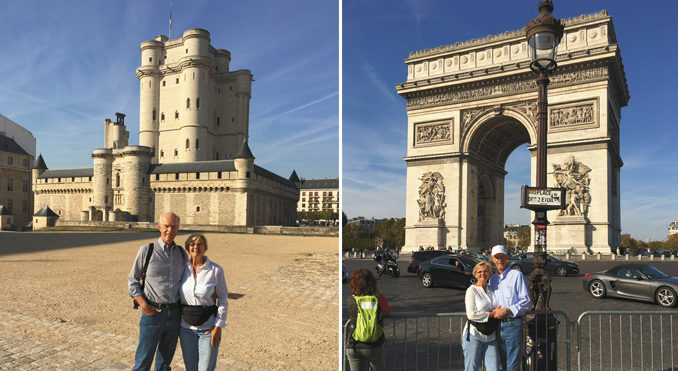 After a timeless 20-minute ride listening to her delightful voice explaining the localities, we emerged from the underground by the Arc de Triomphe, the very spot where the Champs-Élysées ends, or starts. Magnificent, as the origins of the Champs-Élysées can be traced to 1640 when space was cleared to plant a line of trees. Nowadays, its buildings are high-end stores, cafés and offices, ideal for shopping and a stroll down one of the most beautiful avenues of the world, the site of the Tour de France’s last stage. 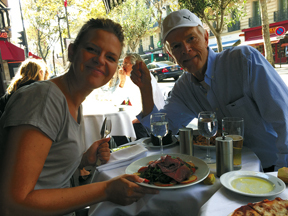 Of course we had to have lunch at Domani, but hey it’s Paris, and after all we are used to Hampton’ prices. And as it happens when one travels with angels, the Arc de Triomphe offered its one and only ENTRANCE FREE DAY of the year that day! When we’d planned our Paris adventure we had already decided to not stand for a couple hours inline to ride up to the top of the Eiffel Tower, but to climb up the Arc de Triomphe, 164 feet high, instead; where visitors get a breathtaking 360-degree view of the city including the Champs-Élysées. The Arc de Triomphe honors those who fought and died for France in the French Revolutionary and the Napoleonic Wars, with the names of all French victories and generals inscribed on its inner and outer surfaces. Beneath its foundation lies a vault for the Tomb of the Unknown Soldier from World War I. The tomb represents the 1,500,000 soldiers who died during the war. 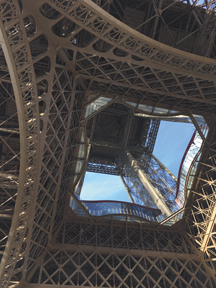 Of course we got to take lots of photos of the one and only Eiffel Tower, after all Kasha grew up here and knows of the most picturesque angles, including from below. 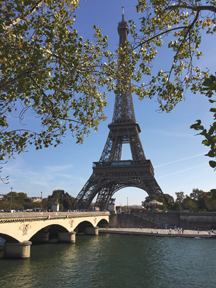 The Eiffel Tower, 1050 feet in height and built for the 1889 Paris Exposition, was the tallest man-made structure in the world for 41 years before being surpassed by the Chrysler Building in New York, and was not intended to be permanent. The tower was going to be demolished in 1909, but was saved because it was repurposed as a giant radio antenna and is today the most visited paid monument in the world with about seven million people annually. — With only two full days in Paris we had to decide what was important for us to see and since we’d visited St. Petersburg, Russia’s museums and palaces including Peterhof and Winter Palace just a couple of years ago, we decided to skip Versailles and the Louvre this time. Sacré-Cœur, the second most visited monument in Paris, the highest point in the city was our next destination, instead. The Basilica of the Sacré Cœur is located at the summit of the hill of Montmartre, on the right bank of the Seine. To reach the Basilica the three of us climbed 270 steps; and were rewarded with magnificent panoramic view of Paris, including Notre Dame, the Eiffel Tower, the Pantheon, the Opera house, Montparnasse Tower and the Pompidou Centre. On this spot, at the beginning of the 3rd century, the first Christians of Paris with their bishop Saint Denis were martyred, giving the hill its name “Mount of Martyrs”. 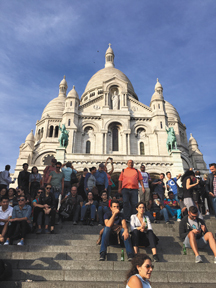 Throughout the centuries Montmartre has remained a major place of prayer but the town itself is a bustling mix of colors, cafes, and art where tourists get to mingle with the locals. Of course we had to sit down here in in one of the street cafes for coffee and petit fours. Marcus and I got to spend one more amazing day adventuring on our own in Kasha’s quasi neighborhood, where we discovered Château de Vincennes. A massive royal fortress in the town of Vincennes that has played an important role in the history of France and is one of the most impressive and largest castles of the country. During the 13th and 14th centuries it was the Royal residence, and several future kings were born at Vincennes. It was the heart of the French monarchy until 1682, when Louis XIV chose to settle in Versailles. The Château was then used as a prison from the 16th up to the 19th century: Fouquet, the Marquis de Sade, and Mirabeau were held here. Under Napoleon I it was transformed into barracks and arsenal, and the fortress protected Paris during invasions in the 19th century. The castle was one of the first buildings in history to use steel to reinforce the walls. We broke for lunch at “Les Fées Papilles – Restaurant de cuisine créative” — amazing, superb, fresh, to die for cuisine, worth every Euro; unlike Domani in the city, still riding on location and the way they were. Forever grateful to our friend Miro, his family, and especially his nice, Catherine, who is unforgettable in so many beautiful ways. Until next month from Bulgaria!